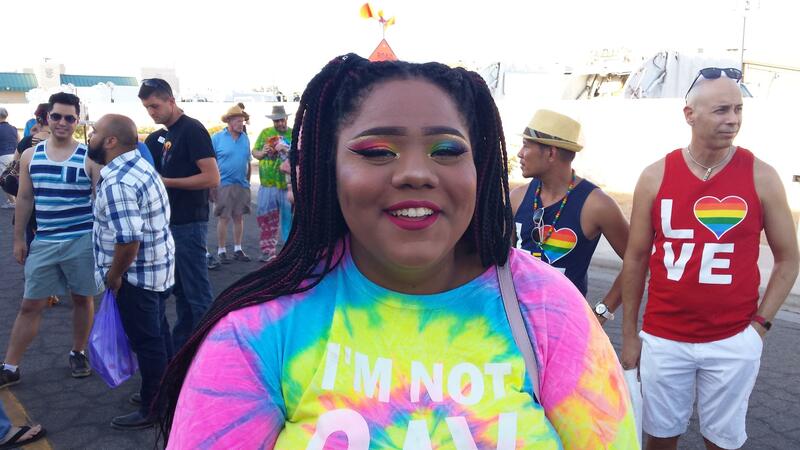 Pride-goers wore rainbow everything...including makeup. Robert Schultz, a.k.a. "Sister Bare Ly Covered"
It’s late afternoon on 2nd Avenue outside the Littlewood Fine Art & Community CoOp, an art community center. The CoOp is usually colorful, with paintings hung on every wall of the building and murals on the outside. But today, the colors spill out into the street. A crowd of more than a hundred shouts and dances, wearing rainbow flags as capes. People sit on their significant others’ shoulders, decked out with vibrant hair, makeup, jewelry, and personalities. 23-year-old Riley McMaster is dressed in drag—a wig, fishnet tights, and dark, dramatic makeup. McMaster says having his first Pride in Yuma was important to him. Yuma natives and folks from all around the state came here for Yuma’s celebration of the Lesbian/Gay/Bisexual/Transgender/Queer community. The event includes drag shows, costume contests, local bands, and started with a brief parade. 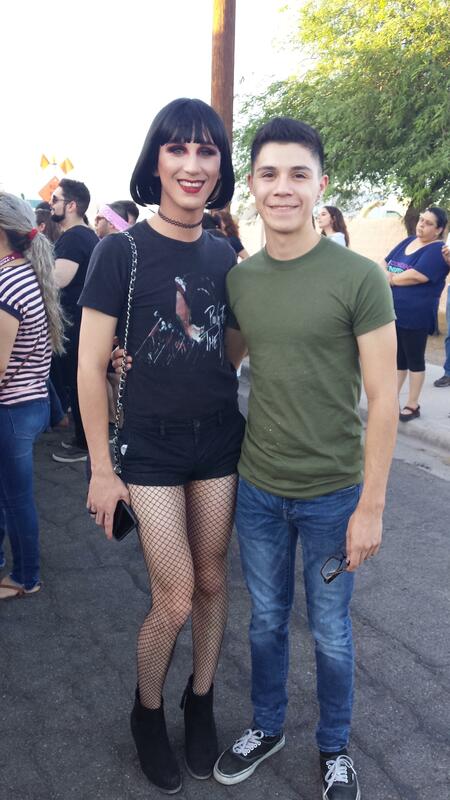 The event is historic—at least one person uses the word “legendary.” It’s Yuma’s first Pride event ever. Democratic State Representative Charlene Fernandez, Democratic State Senator Lisa Otondo, and Yuma City Councilman Michael Shelton also attended—as well as Kelly Fryer, a Democratic candidate for Arizona Governor. She stands atop a wooden crate to give a speech to the crowd and calls over her wife, Tanna, to stand by her side. "Eight years ago, I would've never seen this many gay people or lesbians in one spot without them having to look over their shoulder in fear." -Robert Schultz, "Sister Bare Ly Covered"
There was some concern on the part of the organizers that there could be trouble. Yuma Pride was put together by AllYuma—an organization seeking legal non-profit status in hopes of starting a community center to support LGBTQ youth. AllYuma brought local security on board to hold off any violence or picketing, but to their surprise, protestors never came. “Sister Bare Ly Covered”, or Robert Schultz, a so-called “21st Century Nun”, visited from Miami Globe, Arizona to “bless” the event with glitter. Wearing a beaded blue modified nun’s habit, he says he of all people knows how much Yuma has changed; he lived here until 2010. 21-year-old Sergio Manriquez says he was just as shocked to see Yuma’s acceptance, but it was a pleasant surprise.